BUT: it is not too late to get “IN” on the 2014 Winter-Stock-Up Share:• receive 50 to 60 pounds of organic winter veggies grown by John Krueger at Circle Brook Farm (formerly known as: Starbrite Farm), intended to get you through the winter. • one time pickup on Tuesday, November 25th 2014 in the late afternoon and evening. (Which is the Tuesday before Thanksgiving, and the week after the last regular CSA delivery). • non-members can still get a Winter-Stock-Up-Share: send an e-mail to eve at csanewark dot com and/or stephanie at csanewark dot com for details on how to get on the list. We will be offering one additional share to be delivered during the week of November 23th (Thanksgiving week). This will be a “stock up” share and will include various vegetables that store well, so that you will be able to enjoy produce from the farm well into the winter months as well as provide veggies for you Thanksgiving table. The total weight of this share will be between 50 and 60 lbs. Approximately a third of the share will be an assortment of butternut, acorn, buttercup (kabocha), delicata, and sweet dumpling squash. The share will also include an assortment of root vegetables such as carrots, beets, parsnips, turnips, celery root and radishes. I expect that the root crops will comprise about 12 lbs. of the share. We had a great potato harvest this season and an excellent onion and winter squash crop as well. There will be about 25 lbs. of potatoes and onions in the share. The potatoes will include some fingerlings and an assortment of other varieties of potatoes. Also included will be cabbage, and whatever greens we still have in the field at this time, such as arugula or other mustards, and spinach. It is possible that there will be broccoli, cauliflower, or Brussels sprouts, but I cannot guarantee their availability at this time. The cost of this final share will be $80, which is an excellent value, equivalent to a wholesale price for much of the produce included. The potatoes, onions and squash can be stored in a cool dry place such as an attached garage or enclosed porch, where they will not freeze. The root vegetables and cabbage will best be stored in your refrigerator. I know that this final share will not work for everyone, but I hope that many of you will be able to participate. Doing so will help me to make use of the produce that we have in storage, utilize what remains in the fields, and finish the season with enough money in the bank to pay the bills during the winter months. 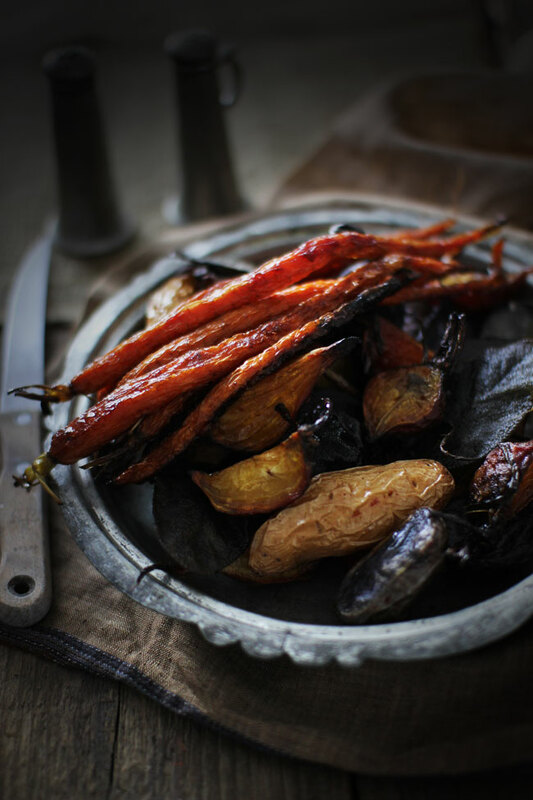 image credits: the beautiful photo of roasted winter veggies above is from flourishing foodie – a food blog with stunning photographs and a great recipe for roasted winter vegetables. If you have never roasted squash, fennel, carrots, or beets before – I highly recommend it. It is a truly transformative process. Personally, I never add brown sugar as the recipe from flourishing foodie suggests, since the natural sugars in the veggies are enough to create the sublime caramelized sweetness of roasted veggies – but if you really, really like it extra sweet – go for it!